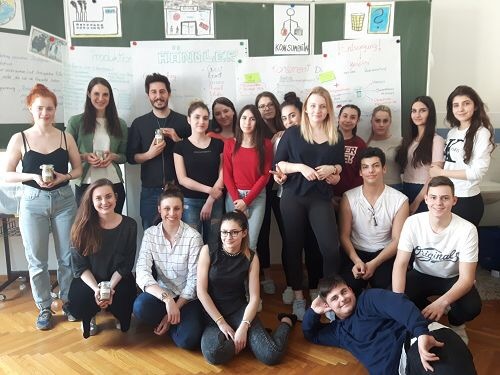 The Project Ecognize was founded by members of oikos Vienna and the “Ökosoziales Studierendenforum”, and hence provides a platform where students can share their knowledge about sustainability with younger ones. Not only will the overall topic of the “Sustainable Development Goals” be discussed in schools, but also separate Workshops for the 17 individual goals will be developed and held with the younger students. By means of autonomous group work and discussions the youngsters are encouraged to reflect upon their own behaviour in these matters and awareness for a sustainable lifestyle should be raised. The first workshop, which was already held in several schools in and around Vienna, deals with SDG Nr. 12 – sustainable consumption. For many more to come! The 2016 published Sustainable Development Goals of the United Nations should be integrated into our youth’s education as early as possible, in order to make them aware of the social and ecological issues we are facing today AND, even more important, to show them ways of how each and every one of us can contribute to tackling these problems.